Frequently Asked Questions about Facebook privacy, settings and notifications. To see fewer posts from the group in your newsfeed, click the right down arrow button in the top right hand corner of the post. You can either hide that particular post, which will hide it from your newsfeed (though you can still see it if you go into the group itself), or you can choose to Unfollow the group (the third option), which will remove ALL posts from the group from your newsfeed. In order to see what’s happening in the group, you’ll then need to find the group and go into it. 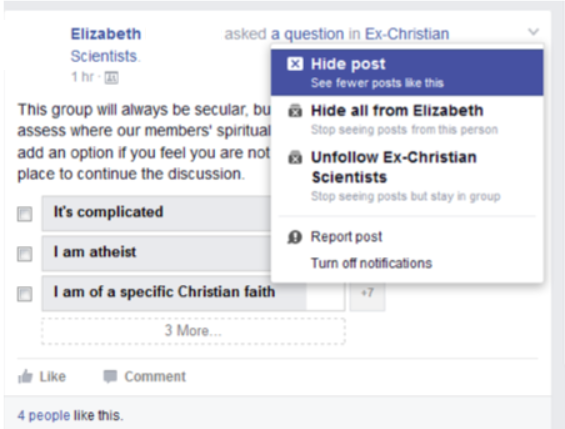 Once you click Hide post, you’ll also have the option to “See less from Ex-Christian Scientists”. If Facebook is showing you too much from the group, but you’d still like to see the occasional post in your Newsfeed, choose this option. 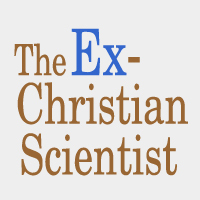 Ex-Christian Scientists is a Closed group. This means that if you do a search for “Ex-Christian Scientist Groups” on Facebook, you can find it, and see who is a member. We make it that way so that those who are searching for a supportive group can find us. But a non-member absolutely cannot see the discussion, what is posted, or what is said—and there is an intense screening process by the admins for new members to keep the community safe. Remember that the group is full of many different kinds of people, and its primary purpose is to create a safe space to process the feelings its members have on leaving the Christian Science Church. Sometimes members will post articles or images that can be controversial, as part of the process of leaving a religion is identifying with what that religion is not. It’s helpful to realize that not everything will be your cup of tea, just like things you post or agree with may not be liked by other members. We make a big effort to protect everyone’s freedom of speech. However, if any attacks are personal or egregiously offensive, the admins will step in and speak to the offending member, and may remove them. In the top content section with Godzilla and the Mother Church, there is a button that says “Joined”. If you click on it, it opens a drop-down menu that includes the option to “Leave Group”. Click on that, and you’ll be removed.